Tony Hooper (right) speaks with Celia Crie Knight of Knight Marine Service of Rockland as his lobster boat Liberty is hauled in for repairs on Monday afternoon in Rockland. Liberty has been intentionally sunk three times in the past six weeks off Port Clyde. PORT CLYDE, Maine — Lobsterman Tony Hooper said he has no idea who is trying to put him out of business by repeatedly sinking his boat, which has been put out of commission three times in the past six weeks. For this year, they have likely achieved their goal, Hooper said. Hooper’s boat, Liberty, was found under water early Saturday morning off Port Clyde. Maine Marine Patrol Sgt. Matthew Talbot said Monday he has never seen one boat be targeted so many times. The boat was initially sunk on Aug. 17. In that instance, the vessel went to the bottom of the harbor, causing considerable damage to its engine and electronics. The vessel was hauled out of the water and repaired. Then, shortly after being put back into service, it was cut loose from its mooring and had its hoses cut, causing it to start sinking again on Sept. 28. The boat grounded on shore and was swamped with water up to the railings, Talbot said. Hooper had the engine serviced and put the Liberty back on the water in the St. George village of Port Clyde later that week. Last weekend, the boat’s hoses were once again cut, and the boat was again cut loose from its mooring. The Liberty sank completely this time, the marine patrol sergeant said. Hooper was going to have the vessel hauled out of the water Monday, Talbot added. September and October are typically the months with the greatest haul of lobsters in the Midcoast. Talbot said the investigation into the sinkings continues. Hooper said he fished off Port Clyde for 10 years, then went fishing off Monhegan for three years before returning to Port Clyde waters last year. He said he has had traps cut every year, including this year, but that the interference was nothing out of the ordinary until his vessel was sunk in August. He said he has no idea who or why his boat is being targeted. He said he does not know whether he will be launching it again this season once it is repaired. He estimated his losses thus far at more than $30,000 including lost income. Hooper said he is not insured. The Liberty was hauled up to Knight Marine Service in Rockland on Monday afternoon. 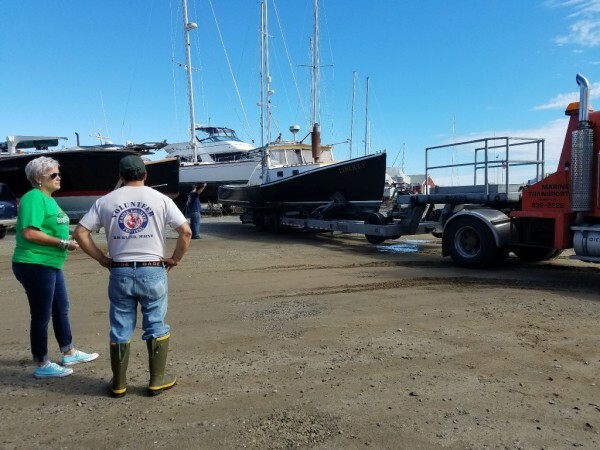 Three men have been charged in connection with the apparently unrelated Sept. 1 sinking of the lobster boat Oracle in the St. George village of Tenants Harbor. That sinking of the boat owned by Joshua Hupper caused damages well in excess of $50,000.